Quotes About Living - Doe Zantamata: Self-Worth - Being "too nice." Self-Worth - Being "too nice." 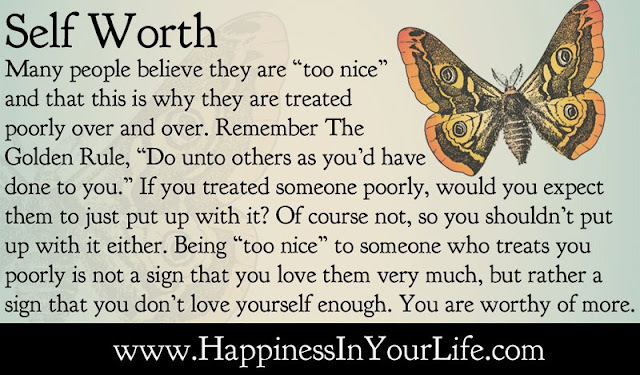 Many people believe they are "too nice" and that is why they get treated poorly over and over. Remember the Golden Rule, "Do unto others as you'd have done to you." If you treated someone poorly, would you expect them to just put up with it? Of course not, so you shouldn't put up with it, either. Being "too nice" to someone who treats you poorly is not a sign that you love them very much, but rather a sign that you don't love yourself enough. You are worthy of more.